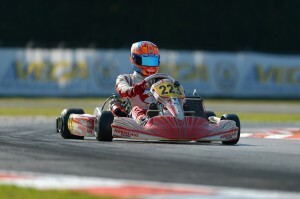 Announcing that he would compete in some of the world’s largest karting events with Tony Kart Srl. affiliated team Morsicani Racing, Devlin DeFrancesco continues to gain experience and build upon several podium results. Claiming pole positions, heat race wins and a podium result in the CIK FIA European Championships, the talented driver also ran at the front of the field in the CSAI Italian Championships opening round. Not only was Devlin one of the drivers to beat throughout the two events, he also set an event record for the fastest race lap at the European Championships a few short weeks ago. 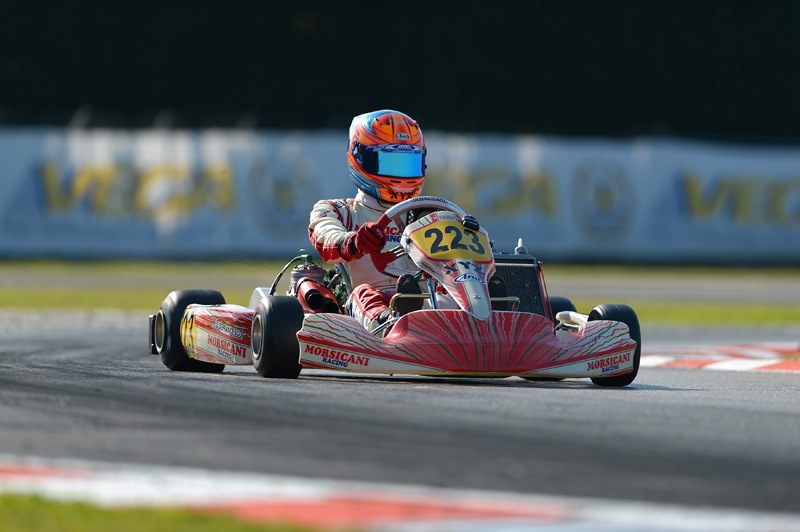 Opening the main part of his European karting season at the CIK European Championships, DeFrancesco instantly made a name for himself in the KFJ (Junior) division. Competing at the famed La Conca facility in Italy, the Tony Kart driver managed to score the pole position and three wins in the four heat races, finishing the other in second. On the pole position for the prefinal, DeFrancesco continued his winning ways taking the victory and securing an inside front row starting spot for the day’s final. Battling hard to stay at the front of the field, the Canadian born Italian and American driver managed to maintain his position at the top of the field and claimed a third place podium result. This past weekend, Devlin would travel to the opening round of the CSAI Italian Championships where he would once again be at the front of the field. Qualifying in the eighth position, DeFrancesco used the heat races to his advantage to move forward. Claiming second and sixth place finishes in the heats, the Morsicani driver managed to maintain his position near the front of the field adding a second place result to his resume in the first of two finals. Inverting the top eight for final two, DeFrancesco would start the second main event from P7 in his hunt for victory. Quickly moving forward but running out of race laps, DeFrancesco added his second top-five result of the weekend, narrowly missing the podium to come home fourth. Devlin DeFrancesco and his Morsicani Racing Team will now travel to Zuera, Spain for round two in the CIK European Championships. Sitting second in the points and one of the favorites to top the blocks, DeFrancesco will continue his work with Morsicani Racing and his coach, Will Thompson in the hunt for victory. Based out of Latina, Italy, DeFrancesco, along with his new Morsicani Racing team plans to compete in CIK FIA European Championship, WSK SuperMasters Series, European Winter Cup and Italian Championship. For more information on Devlin DeFrancesco Racing’s, please visit them online at http://devlindefrancesco.com, or follow him on Twitter at @DFR_USA, @DevlinD00. Devlin DeFrancesco is sponsored by: Alpinestars, BRM Watches, YogenFruz, and Cold Stone Creamery.